The game is unplayable by default on Windows 10. See Warhammer 40,000 Chaos Gate Windows 10 Patch. Warhammer 40,000: Chaos Gate Updates contains all the currently released patches for the game. Full rebinding in the options menu. The game has compatibility issues on Windows 10. See Chaos Gate fixes for Windows 10 for various fixes. Hovering tooltips can slow down the game immensely. 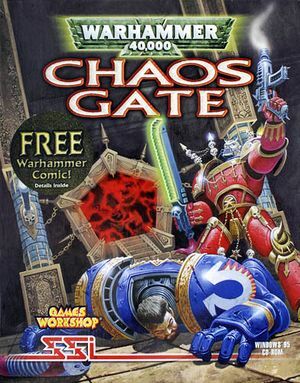 Download the Warhammer 40,000 Chaos Gate Windows 10 Patch. Enable the following compatibility settings for WH40K.exe located in <path-to-game>. Make a backup of the WeapDef.dat file before editing. Open WeapDef.dat with a text editor. Go to line 201 and change PlazPistHit.wav to PlazpistHit.wav. Go to line 165 and change 4 #Animation to 5 #Animation. Go to line 200 and change 2 #Number of Sound Effects for Firing to 1 #Number of Sound Effects for Firing. Go to line 202 and add # to the beginning of the line. The installation path can only have 2 subfolders and 35 characters total. So if the game crashes place it further down. See Rainbow color problems in older games for solutions.